Rear view of the songthaew doing the Phuket to Karon Beach line, parked at the terminus in Ranong Road, with Thai people inside waiting for it to leave. Phuket Town, Thailand, October 16, 2014. It was evening time in Chiang Mai, Thailand. I was on my way to a marketing meet up at a coworking space called Punspace. It was traffic hour around this time and I was finally able to wave down a red truck taxi. 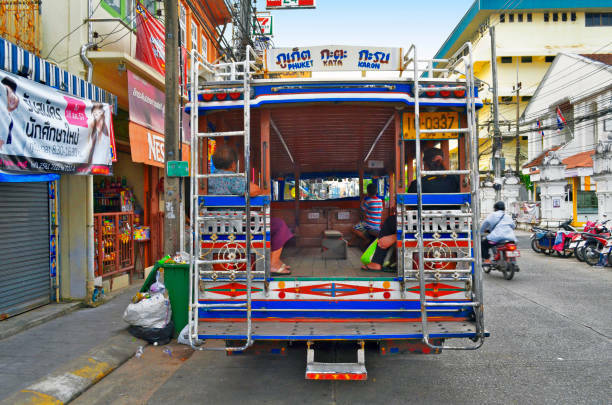 In Thailand, there are these red trucks called “songthaews” that act as taxi cabs. You simply just signal one down, tell the taxi driver where you are going, negotiate and then hop in the back of the red truck. The red truck pulled up beside me, the driver rolled down his window and then he asked me in broken English where I was going to. I told the driver where I was off to, and he said “50 baht”. That was about $1.50 in the States so I happily agreed. Usually, I was supposed to hop in the back of the red truck but the driver was not too sure where I was heading, so he asked me to sit in the passenger side. There are a ton of motorbikes zipping through traffic. I can imagine traffic accidents are quite frequent in Chiang Mai. With that said, I did not mind sitting in the passenger seat in case we got into a car accident, I was unsure if a car accident attorney would be able to seek compensation in Thailand. I opened the door, smiled, and sat down next to the driver as I put the GPS on my phone for the driver to follow. We lightly conversated on where I was from and what I was doing out here in Chiang Mai. I hardly spoke any Thai but I was able to tell him I spoke a little bit of Thai in his native tongue. He could speak enough English to get by with basic conversation. Red trucks are taxis but they usually pick up other passengers who wave them down on the way to the destination. A group of Chinese tourists signaled for my driver to pull over. The taxi driver rolled down the passenger window and asked where the tourists was going…in Chinese. The taxi driver said “just the basics” as he reached to the front of his dashboard to pull out a Chinese language book. I sat there amazed at this taxi drivers work ethic. I continued to conversate with the taxi driver as I was genuinely curious about this drivers’ story. He mentioned his poor life growing up, his struggles to raise a family and how he is just doing the best to provide for his family. He works 10 hour days as a taxi driver to make sure there is food on the table for his family and he can save up for his kid’s education. Taxi driving is competitive in Chiang Mai but his Chinese speaking ability gave him a little bit of a competitive edge. I have to add that he didn’t share his story to get my sympathy, he simply shared his story with the sole intention of sharing himself. It was genuine and I could feel it. I was awestruck. It made me remember how blessed I am to grow up with my family providing me with everything I needed. They provided me with food, a roof over my head, insurance so I can feel safe, and they did everything in their power to make sure I graduated from college even though they were never given the opportunity to. The taxi driver dropped me off at my destination and was wearing a smile from ear to ear. He gestured goodbye and left to drop the other tourist off at the airport. I will always remember this Thai taxi driver. The lesson I learned at that day was how blessed I am. I did not grow up in the wealthiest family but they provided food, clothes on my back and a ton of support. Meeting this taxi driver inspired me to continue to believe that if I worked hard and kept persevering, I would make it through. I strolled into Punspace with a giant smile on my face.